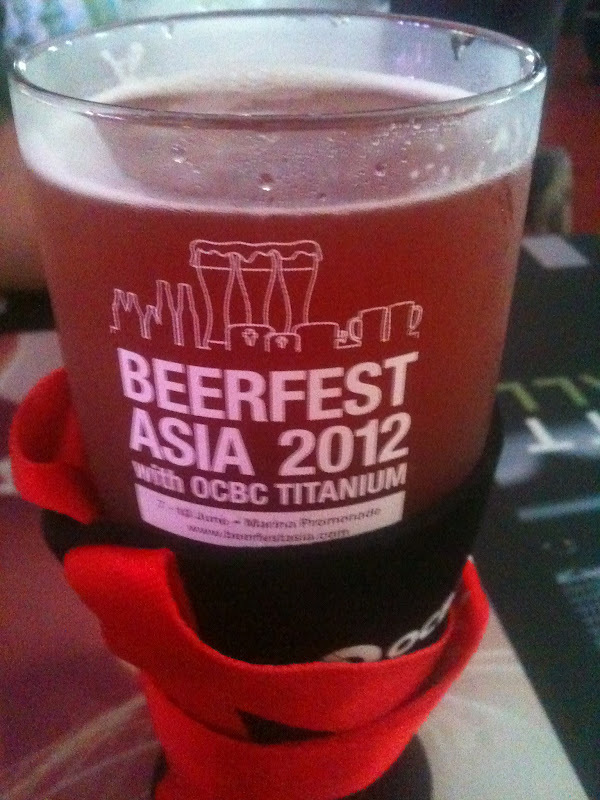 Unbelievably (as it seems to have come around again so quickly) it's Beerfest Asia 2012 this weekend! Was the last one really a year ago? I was lucky enough to get tickets again this year, and we went along on the Friday evening. This year the VIP tickets included a complimentary t-shirt (like last year) but also a very handy beer glass for your refills, as well as a beer cooler complete with handy strap for ease of carrying around your neck (see my photo below). Though there was part of us that was a little disappointed that this meant we couldn't get the obligatory photos of all the empty beer bottles (like last year) and, of course, get to read a little about the beer whilst sampling it. Though the festival programme does give you some of that information of course! 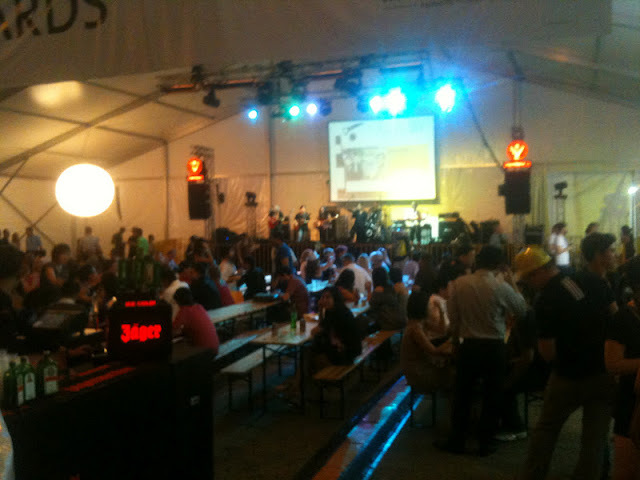 Like last year the festival is on at the Marina Promenade on the F1 tracks and this year features three hundred and fifty different beers as well as numerous live music and comedy acts. Anyone who knows me well will know I'm not a huge beer drinker and last year managed to find a delicious (it didn't really taste like beer) lychee beer to enjoy. That beer was back at the festival again this year but this time I settled for a strawberry flavoured beer and a grapefruit flavoured beer. In my opinion both were great as the beer flavour was minimal. I'm sure there are many true beer fans reading this in horror but never fear there are plenty of beers (and ciders) for you to enjoy too. I'll be honest in that I'm not sure it was quite as good as last year's festival, but I wonder if that is more because there was a big crowd of us last year so therefore more opportunity to try a bigger variety of beers. Also getting food from the food tent this year seemed a lot more chaotic than last (a multitude of orders taken all together and then a bit of a scrum to actually get your order once it was ready and called out) but perhaps we just picked a bad time to eat and my memory over the course of a year has faded. However don't just take my word for it, there is still a day of the festival left and tickets can still be bought here, so go see for yourself!